Through a recommendation on Jay Cross' Internetime Ning, I was invited to speak on 31 August, in session 3 of the "New Learning for Sustainability in the Arab Region" meeting in Alexandria, Egypt. 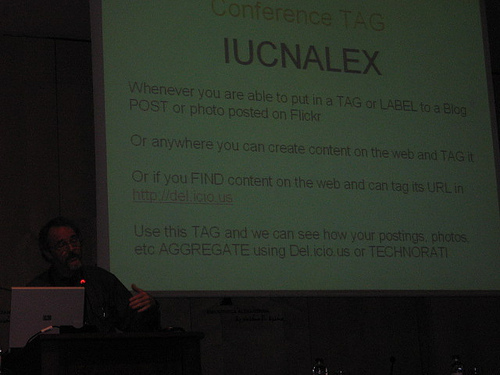 The conference seeks regionally-based experts working in informal learning, web 2.0, active bloggers, etc. Abstract (106 words) - This talk addresses prospects for introducing Web 2.0 in Arab education systems. Although Web 2.0 is seen by advocates as having transformational influence on educators and students, its uptake from informal to formal learning situations proceeds slowly in the Arab region. This talk identifies ten aspects of the paradigm shift required for Web 2.0 acceptance, and ways that educators can act as change agents for themselves primarily, but affecting eventually their institutions as these reflect the stakeholders changing themselves and those around them. As I was about to go on leave last June (2007) there occurred on a teachers' list I follow a classic thread. It was beginning to dawn on the teaching professionals on this list, many of them teachers of Arab learners (as the list is administered and moderated in the UAE) that their students were about to toss their books aside for the summer and forget much of what they had been 'taught' so painstakingly the year before. The posts explored how the students might be given 'assignments' for summer work, or motivated to keep diaries. When it occured to the list participants that motivation was going to be lacking in these students, I chimed in with the suggestion that the teachers might try introducing their students to blogging. The problem with motivating students to keep paper based diaries or journals is that there is essentially no audience for them. Some students might write in them to impress a teacher they respect, but only in rare cases would this sustain itself during a summer holiday. Blogging on the other hand exposes students to a world-wide audience. A blogging habit is happily coincidental with a technology-rich learning environment (wherever that happens to be: school, home, the city). Blogs are also in tune with sophisticated ways that knowledge is distributed over the Internet, which in turn contributes to tapping in to that world-wide audience. Facilitators of learning (as opposed perhaps to 'teachers') in schools and informal learning situations all over the world are reporting remarkable results from having students blog. Their results are documented in teachers' blogs, podcasts, videos on YouTube (and TeacherTube), in other artifacts scattered over the Web attesting to their successes. However, such evidence tends to be accessed mainly by people who not only use but explore and are fascinated with the Internet , and particularly Web 2.0, and its potential for education. The (dwindling) majority of teachers not so predisposed tend to be unimpressed with evidence presented in media that they prefer to ignore, and so my intrusion in that list discussion just mentioned was met with silence, and the list carried on discussing how students could be coerced into practicing their writing into a summer where no teachers would be wielding deadlines or sanctions. Changing the learner paradigm: How are tools such as Web 2.0 in formal education changing the learner paradigm in content creation, and how are we seeing this in the Arab region? This anecdote illustrates the state of paradigm shift in education as reflected in this small cohort of expatriate language teachers in the Middle East, but I think it's fairly typical of attitudes in the region. I have been in the Arab world for most of my teaching career but I keep abreast of what's going on in my profession through use of numerous CMC (computer-mediated communication) devices. These devices, these means of communicating with professional teaching peers constantly both synchronously and asynchronously, have revolutionized what it means to be an expat teacher in the Middle East. When I started teaching in the area in the 1970's and through the mid-90's to be expat meant you were 'out of the loop'. It meant that if you stayed away too long you were assumed to be falling behind in your career, that you were trading the ability to stay on top of your game for the material benefits of life overseas, and many aging expats at the time got caught in the cycle of contract renewals, unable to compete for jobs back in the real world, partly because they had simply lost their edge. Now that we have Web 2.0, the conversational read-write web, an ability to get information online almost instantly and interact with others in distributed peer-to-peer learning networks (distributed means that the members of the community can be almost anywhere in the world, wherever there is an Internet connection) it is possible to stay abreast of new developments in your profession as easily as anyone living in Europe or North America. Not only that, but you can communicate directly with the experts in your profession ... and read what they are writing and hear what they are saying the instant the words leave their computer. To be an expat now no longer means you are without knowledge and resources (caveat: on the 'wired' side of the digital divide -- and where wealth has been used equitably in the Arab world, the people in the region have good access to Internet resources). However, to take advantage of the new technologies in one's learning or professional development, a change of thinking is required. Yet in North America, Europe, in the Middle East and elsewhere there are professionals who have not made the adjustments necessary. And getting back to the anecdote that I started off with, the list members who were wondering how to motivate their students to write in journals using the old, static, minimally interactive technologies of pen and paper, had clearly not made the paradigm shift that might have led to renewed learning opportunities for their students this very summer. Let's examine the nature of the shift required. There are many ways that thinking about education must be readjusted. I have listed ten such aspects below which the teachers mentioned earlier had not made. Interleaved here we can speculate on what kind of outcomes might have been achieved, had the teachers made these adjustments. Or put another way, what should these teachers do starting now in order to reverse this situation for next summer? Pedagogy: Didactic --> constructivist - In order to accommodate the benefits of the read-write web, where users create content and take control of their Internet media, teachers - and let's not call them teachers, let's call them faciliators - facilitators must ascribe to constructivist principles in their teaching practices. I suggest that faclitators guide their students into blogging because their students would acquire a habit that would give them not only an outlet for their ideas, and needs and desires to communicate them, but also an audience for these ideas. This embodies the constructivist notions of learning wherein students have control over meaning, convey what they want to convey, and scaffold one another through peer audiences, not authoritative teacher ones. There is ample evidence that this works. I can site Graham Stanley (2006) in the print literature, Paul Allison and his work with the teen voices project in both video and audio podcast multiliterature, and feedback of my colleagues in the Writingmatrix project. One of these colleagues, Saa in Slovenia, told me that one of her students had started a blog this summer dedicated to his summer adventures (exactly what our teachers in UAE were trying to achieve). Nelba Quintana, another of these colleagues, was organizing Yahoo Messenger voice chats between her students in Argentina and those of Doris Molero, another teacher in Venezuela. The students had met as they encountered each other's blogs in the course of working with the Writingmatrix project. There is plenty of evidence to support the fact that blogging works to encourage students to express themselves, and sometimes to flourish when they find audiences in peers, occasionally within but often outside their immediate environment. Modeling: Do as I say --> AND as I do - In order to apply constructivist principles in teaching practices effectively, teachers must apply them in their own personal learning practices. This step is often skipped in teaching training programs that attempt to teach teachers (there's that word again) how to get their students blogging (as one example) when the teachers themselves don't blog. In such situations many teachers might start their first blogs along with their students, but there are indications that when the teachers themselves are not perceived as being passionately committed to what they are trying to get the students to do (by for example actually doing it as part of their daily work routine), the students are not convinced that they should embrace the practice either, and the compounding effects of reduced expectations can compromise the endeavor. There is also anecdotal evidence that teachers who don't utilize Web 2.0 and social networking in the classroom or wider learning environment produce students who don't do so either and who don't feel such tools are relevant to their lives (e.g. Cheri Toledo's presentation at FOE2007). Teachers should try out blogging themselves. One good topic for teachers is reflections on the nature of learning and teaching and tensions between the two in contexts impacted by technology. The teachers might find that blogging helps them to articulate and better understand whatever aspects of their profession most interest them or which they are most curious about coming to grips with. Blogging is also a good start toward understanding the social networking aspects of Web 2.0. Transfer: Technology enjoyed at leisure --> applied to professional practice - There is similar evidence (Sessums and Glogowski at WiAOC2007, for example) regarding students and teachers who don't use these tools professionally through they might use them extensively in their private and social lives. They might upload photos to Flickr for example, and geotag them so they will appear on Google Earth, or use other mashups such as Craig's list and mapping tools to locate apartments and businesses, or provide customer feedback on Ebay or Amazon, or use Skype or other IM tools to communicate with friends or family, or connect socially via MySpace or Facebook. What was referred to by Sessums and Glogowski as 'the kicker' was that when these people are teaching professionals or students it doesn't often occur to them to use these same familiar tools to enhance the learning experience. Teachers who encourage their students to blog gain more traction with their students when they are experienced bloggers. Even novices would find ways that using blogs helped with class management and atmosphere. They would find ways of interacting with their students that they hadn't considered before and in so doing they might more naturally come upon ways to bring in other media into their teaching, embedding YouTube videos into blogs for example, which might due to firewall restrictions be something students would have to do off campus, which might suggest ways of hooking up with those students in synchronous or asynchronous spaces as incentive to work outside of class. Through using a wider range of web 2.0 tools, a culture of outside-the-class learning might start to take hold. This culture might then carry over into the summer. Trepidation: Will they find out --> I dont know refers to fear of exposure, loss of control vs. a shift to willingness to admit, "I don't know" and then further to "Let's find out together." I have sometimes pointed out that it is suprisingly simple to become an expert in technology as it is applied to education because the field changes so rapidly, wherever you decide to enter it, you will quickly learn something that someone who got in a year ago hasn't picked up on yet. When you investigate technology, you will likely Google the latest sources and might soon learn more about your niche than someone you think is an expert but who hasn't Googled that niche lately. Also, when using social networking tools you will likely find the people you connect with to be friendly and supportive. Yet for many who are still putting off entering the fray, some who are perhaps hoping that they can finish out their careers in undiscovered ignorance, the world of technology is a vast desert with no obvious entry points, and the question of when to begin is complicated by 'where?. Knowledge that was taken for granted one year, making a phone call and sending an SMS message on a cell phone for example, or working a remote control appliance, is suddenly complicated when the phone acquires Internet capabilities, or one needs to program one remote device to handle all the appliances in the living room. Teachers should not delay looking into ways to integrate more technology in their classes as soon as possible. Trepidation would be reduced once the teachers started learning, started interacting in interesting ways with their students, and started interacting online with other teachers whom they might encounter through use of common social networking tools. Soon they would be looked up to by other teachers seeking to enter at the bottom where these teachers had been but were no longer. Enhanced Self esteem and confidence in feeling able to cope with an increasingly complex future would be its own reward. Literacy: Print literacy --> multiliteracies - The journey toward paradigm shift is complicated because the vehicles are all different from those many educators grew up with. Print literacy, with its implications for power distribution in society when one dominant faction decides what is worth getting published, is now being subverted by the emergence of many other literacies (incorporating multimedia, requiring new skills, and involving new rules of who gets to say what gets published). The art of communication is changing in a world where familiarity with technology determines how your message is conveyed and whom it reaches. The ability to construct and defend an argument, to persuade, to cajole, and to entertain in print all remain important, but knowing when it is appropriate to enhance a message using other literacies, and more importantly HOW, are skills we educators must rapidly master -- and we have responsibility to inculcate them in students in order to prepare them to communicate effectively in their future world. Blogs encourage embedding of many different media in otherwise text-based blog posts, and they open the way for interaction through the heuristics and folksonomies noted in the next two points. They pave the way toward their users' understanding and utilizing the tools of multiliteracy. Heuristics: Client server --> peer to peer - Coupled with multiliteracies are changing conceptions of learning HOW to learn. In an information saturated world, having the information is much less important than knowing how to pull in the information when needed. Learning these days is less and less a matter of memorization or internalizing knowledge and more and more a matter of developing heuristics for finding information and accessing it at nodes throughout your learning network. Connectionism assumes that those nodes are populated by other seekers and providers of knowledge, and each person at each node is at once both. Connectivism (in layman's terms, near in meaning to connectionism) expresses how learning becomes a function of how one is able to make those connections and utilize them effectively. Connectivism regards the network as more crucial to learning than the information contained in the network: "The pipe is more important than the content within the pipe." (Siemens, 2005). Blogs encourage connectivisim through such devices as allowing comments and pingbacks and trackbacks. 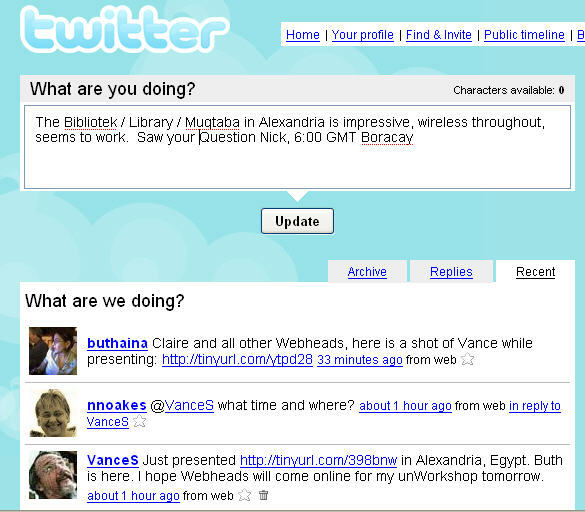 These devices allow writers to see who is reading their blogs and who is linking to their posts. Thus they are introduced to other bloggers, and are able to interact on others' blogs in the same way. A culture of connectivistm is engendered as new insights on learning and acquiring knowledge are revealed. Classification: Taxonomies --> folksonomies - Possibly one of the most difficult shifts to grasp is how organization and classification of knowledge work over social networks. Whereas before, we thought in terms of taxonomies, social networks make possible the notion of folksonomies, where each user, or each node in the distributed learning network, contributes to and uniquely defines the classification system in such a way that it reflects at any time the current state of the network (unlike a taxonomy, which describes from the point of view of one classifier a system as it existed in a state which later may change). A folksonomy is organic and can make that change quickly. On the other hand, a folksonomy can be messy and inconsistent. On the other hand a taxonomy can be messy in the face of countervaling data, as when Pluto is no longer a planet, or is it? A folksonomy would not settle that question definitively either, but the nodes in the network would continually vote on the issue and any user of that classification system could decide based on the opinion suggested by the state of the network at its most current moment. A revealing insight on the issue is David Weinberger's and Andrew Keen's debate (2007) on Weinberger's thesis in his most recent book, All Things Miscellaneous. Teachers should inform themselves on the many uses of tagging and aggregation. Blogs allow posts to be tagged, and Technorati <http://www.technorati.com> allows anyone to find all the posts, blogs, videos, and photos -- "in the known universe" as it says on their site -- that are tagged with the term the user is researching. Using Technorati, social bookmarking sites such as http://del.icio.us, and feed readers for blogs, podcasts, and a plethora of other sources, Internet content can be discovered, retrieved, and tracked automatically. Push --> pull - Accompanying the transformation in thinking on classification is a shift in means of accessing that information. Receiving unwanted email would be a diminishing problem with increasing use of RSS to subscribe to content sources, so that information is 'pulled' into each individual's aggregator rather than being pushed uncontrolled in such a way as to overwhelm the receiver. Pull technologies are already reaching the point where searches of wide ranges of content sources can be refined on categories that can be narrowed by the user to deliver information through sophisticated adjustments of filters. By accessing content based on folksonomies rather than relying on push technologies such as email, the user doesn't have to be aware of the existence of any particular source, as the system will discover it by searching on tagged items. But once a source is discovered, the user can subscribe to it if desired and follow content there more closely. This has implications for classroom and office management, because the information source tracked could be the set of blogs produced by students in a teacher's class, or the output of a committee or taskforce. In order to utilize the technologies related to this, teachers should look into RSS, syndication, aggregators, and news readers. Proprietary --> open source - Another assumption that is on its way to being discarded is the notion that you must purchase software for your computer. This is not to suggest that there is anything wrong with doing that, if what you need is available from a vendor. But a surprising shift is apparent in the success of the open source movement, and the reasons that it works. It is at first counter intuitive that code worked on collectively during its development can be more robust than something produced secretively in-house no matter how brilliant the staff. An explanation for this might be derived from the talks given by David Weinberger, cited elsewhere in this presentation, when he points out that a network is always going to be smarter than its smartest expert. That is, when experts work assiduously within networks they are constantly testing assertions with other nodes in the network and occasionally receive feedback that will impact their thinking. Thus the greater the network, the richer the feedback that serves to increase knowledge within the network. Open Source software is developed within this paradigm of enhanced feedback whereas enterprise software by its nature might be developed within a climate of secrecy and heightened security, and this might ultimately compromise its quality. Copyrighted --> creative commons - The question following from the shift from proprietary to open source models of software development is basically, who would work to develop code for free? It turns out that there are competitive business models peripheral to helping profit-making entities adapt open source software to enterprises who pay for such services. Also, developers might appreciate the fact that enhancement to career can follow from being seen in a community of developers as being a strong contributor to an open source endeavor. Another motivator is a sense of payback, of putting something into a system where everyone benefits. Indeed, copyright is another notion that is being debunked by the read-write web. Creative Commons has become a convention often adopted by content creators to grant rights to other users of that content as long as certain conditions are followed, such as attribution, or share-alike, applied to the work itself and its derivatives. We'll need to rethink copyright We'll need to rethink authorship We'll need to rethink identity We'll need to rethink ethics We'll need to rethink aesthetics We'll need to rethink rhetorics We'll need to rethink governance We'll need to rethink privacy We'll need to rethink commerce We'll need to rethink love We'll need to rethink family We'll need to rethink ourselves." This is the interesting question: how are institutions benefiting? The equally interesting answer, considering the potential, is that by and large, those in the Arab world are not (... yet). I follow podcasts produced by educators who tend to be in North America and at the forefront of using Web 2.0 technologies in the classroom and these teachers report phenomenal results in working with students. They speak of transformational effects and empowering students to develop powerful heuristics for learning. They speak of "preparing students for jobs that don't yet exist, using technologies that havent yet been invented" (from Fisch: Shift Happens). They acknowledge the down side of using social networking in the classroom, the exposure to predators and unsavory elements, but argue for greater freedom in helping students to explore all available Internet tools with analogies such as, do we prevent students from crossing the street, or train them to look both ways? Where better than in schools to inculcate appropriate use of the entire gamut of tools available on the Internet? The kids are going to use them anyway, why not help everyone make that "transfer" (point 3 above). But even these teachers speak of working in isolation, of constantly having to overcome resistance. The present situation seems to be that some minority of teachers have an awareness of the potential of Web 2.0 and are trying to utilize it. These teachers tend to be the younger ones, the emerging generation of digital natives (Prensky, 2001). The more experienced teachers and administrators are having more difficulty making that paradigm shift, or even recognizing the need for one. The reaction of the teachers on the mailing list I spoke of earlier was illustrative of this. I entered their discussion on how to get students writing over the summer using traditional paper-based print literacies. I suggested blogs. The reaction was silence and then a resumption of the discussion on how to getting students writing over the summer using traditional paper-based print literacies. Introducing innovations: What is the process of introducing innovation like this into a traditional institution? Terry Freedman (2006) created an excellent podcast on how to be an effective change agent, and what to avoid when acting in that capacity. For example, one should assume that those one is trying to change are equally sincere in wanting to do their jobs well, and one should avoid taking on a superior tone, one should anticipate counterarguments and be prepared to address them, and so on. I wish I could speak more optimistically on the issue of institutionalizing Web 2.0 in the institutions I've come in contact with in the region where I work. I have worked extensively in Oman and the UAE and have given talks and workshops in Egypt and Tunisia, and am scheduled to give workshops soon in Sudan. Of these countries, the UAE is the most developed regarding e-learning, but even here resistance to change is deeply ingrained. Teachers with with a working knowledge of Web 2.0 tools are only a small fraction of those working at institutes of higher learning in the UAE, where the teaching tends to the traditional. Teachers talk, students listen and then do, and then are tested. If students are asked to do something not to be tested it upsets them, and one's colleagues may not be entirely comfortable with any one teacher departing too obviously from the prescribed curriculum. Finally, the tools for evaluation of both student and teacher performance (by students and supervisors) can discourage departure from expected behaviors. This situation is not unique to the Middle East. I delivered a series of lectures in Spain this summer and was surprised to hear teachers there complaining of similarly rigid systems constraining their utilization of Web 2.0 tools. It seems that in order to bring change to such systems, there must be a paradigm shift in thinking at the top, where the rules are currently made, OR perhaps the so-called subversive elements of Web 2.0 will seep up from the grass roots at some time in the future when teachers themselves are blogging and creating their own wiki-based textbooks (in conjunction with their students), and make their voices heard that way. This is what Web 2.0 is about: empowerment of individuals in what has come to be known as the long tail (Anderson, 2004). Teachers are themselves individuals, and we know that teachers work to impact individual students, so the process of change is taking place in that way at the moment, on an individual basis. And these individuals in aggregate will eventually bring about change once they 'become' their institutions. As regards sustainability, my expertise is in the formation of communities of practice (CoPs) through use of CMC and social networking tools, especially as articulated through the blogosphere. These tools are used by teachers to explore modern technology-enhanced teaching methods, and of course by students to pursue any line of enquiry, often in the course of improving their use of a target language. In any of these contexts, a valid line of inquiry could be environmental sustainability. These tools can be applied to students studying the problem with students in other nations and cultures at a distance. The techniques enhance community building, and an awareness within the community of the scope of the problem, possible ways to resolve it, and how to overcome resistance to suggested solutions. In this talk I have tried to suggest that the process of institutionalizing Web 2.0 hinges on how informal learning informs on institutional learning. In fact, you can't have the latter without the former, can you? Someone has to learn something informally in order to be in a position to organize institutional learning. It's not chicken and egg, it's cart and horse. That's exactly the position we're in regarding institutionalizing web 2.0. Practitioners are learning about it informally and more and more are engaged in the process of institutionalizing what is being learned by the early adaptors. The following day we held a 2.5 hour session demonstrating various almost random aspects of connectivity. [9/3/2007 2:01:16 AM] Jose Rodriguez says (in Skype text): "Hi Vance. Here is the raw audio from your webcast on Saturday Morning. I has 3 hours! http://www.divshare.com/download/1838379-497. Sorry I couldn't get into SL. I had bandwidth issues. I didn't want to download upgrade. I could have steamed there also. Great session." Hopefully I'll have a chance to edit the raw audio and blog the wacky session report. Anderson, C. (2004). The long tail. Wired, Issue 12.10 (October 2004). Retrieved August 20, 2007 from: http://www.wired.com/wired/archive/12.10/tail.html. Fisch, Karl. (2006). Shift Happens. Retrieved August 20, 2007 from: http://www.glumbert.com/media/shift . Freedman, Terry. (2006). Overcoming Obstacles Selling Web 2.0 to Senior Management. Presentation given at the 2006 K-12 Online Conference. Retrieved August 20, 2007 from: http://k12onlineconference.org/?p=72 (has links to text version, and recording). Glogowski, Konrad and Christopher Sessums. Personal Learning Environments - Exploring Professional Development in a Networked World. Presentation at WiAOC 2007, Webheads in Action Online Convergence. Retrieved August 20, 2007 from: http://www.webheadsinaction.org/node/168. Recorded in two parts at http://streamarchives.net/..
Prensky, M. (2001). Digital natives, digital immigrants. On the Horizon 9, 5. Retrieved August 20, 2007 from: http://www.marcprensky.com/writing/Prensky%20-%20Digital%20Natives,%20Digital%20Immigrants%20-%20Part1.pdf#search=%22prensky%22digital%20native%22%22. .
Stanley, Graham. (2006). Redefining the Blog: From composition class to flexible learning. In Hanson-Smith, Elizabeth, and Sarah Rilling (Eds.). Learning languages through technology. Alexandria, Virginia, USA: TESOL. pp. 187-200. Stevens, Vance. (2007). The Multiliterate Autonomous Learner: Teacher attitudes and the inculcation of strategies for lifelong learning. Blog posting from AdVancEducation. Retrieved August 20, 2007 from: http://advanceducation.blogspot.com/2007/07/multiliterate-autonomous-learner.html. Toledo, Cheri. (2007). The Future of Teacher Education: Herding Cats and Chasing Targets. Presentation given at the Future of Education online conference. Retrieved August 20, 2007 from: http://ltc.umanitoba.ca/foe-2007/Cheri_Toledo/. David Weinberger and Andrew Keen debate Weinberger's thesis in his most recent book, All Things Miscellaneous, posted by Kevin Werbach July 9, 2007 in Conversations Hub: Supernova 2007. Retrieved August 20, 2007 from: http://conversationhub.com/2007/07/09/video-david-weinberger-and-andrew-keen/. For the direct video link http://conversationhub.com/podpress_trac/web/259/0/sn-weinberger-keen.mp4 .